The View-Master Model J was produced between 1975 and 1994. This was only manufactured in Belgium and is also known as the European Model 10 (see History for an explanation of this numbering). It is available in a large number of different colour variations with red being the most common. There was even a special purple version produced to celebrate the wedding of Prince Charles to Lady Diana that came in a presentation pack with reels. 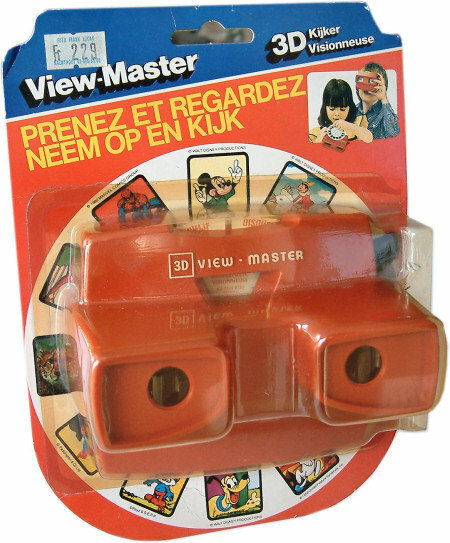 See the "Face Viewers" page to see the model J used as one variant of a Mickey Mouse View-Master. This one has Dutch and French language text on the packet and originally sold for Fr229. Notice the 3D logo, which differentiates it from the earlier GAF manufactured models. A special presentation edition of the Model J viewer in Royal Purple, released by GAF to celebrate the wedding of Price Charles to Lady Diana Spencer on July 29th 1981. The set includes three reels numbered BD210-1, 2, and 3 depicting various pictures of the couple and the ceremony.